If someone were to win the lottery, was that coincidence or fate? When someone is accidentally hit by a car, is that a coincidence, or fate? What if that someone was someone you loved? Signs is M. Night Shyamalan’s stab at the invasion movie, but it winds up being about something entirely different by the end, delving into the role of faith in a world facing impending doom. His alien invasion film is one that uses science fiction at the forefront to explore belief systems in the background, culminating in a firm stance that everyone needs comfort, whether from a higher power or not. The story starts off with Father Graham Hess (Mel Gibson) no longer preaching the gospel after his wife has died in a car accident. That loss of faith is what anchors much of Signs, as the whole world seems to have bought into a belief that aliens have come to harvest them. You can sit there guessing the twist of the movie all that you want, but there really isn’t one of significance; this is not the kind of film that tries to subvert your expectations. Instead, it’s a movie about aliens where the only twist is that water is their weakness. How that reveal means more to Graham than us makes Signs truly one of the best films in Shyamalan’s filmography. There’s a great conversation between Graham and his brother, Merrill (Joaquin Phoenix), as they’re wrestling with what’s going on around them. Merrill gets to hear the side of his older brother that he hates — the bitter skeptic — as Graham explains how different types of people interpret certain events. If you think you’re seeing a sign, then you’re buying into a plan from someone else, and by doing so, you’re comforted — there is some order in the chaos. Meanwhile, there are those who see these signs and recognize them as coincidences. They aren’t looking for comfort, because they’ve already bought into the idea that life isn’t going according to plan, instead believing that it’s going to be a messy ordeal at every corner. As previously mentioned, Merrill hates this. The entire conversation began as a means of finding comfort from his older brother, and it ends with him being told that Graham’s wife’s final words not only involved Merrill, but were also insignificant (or so Graham has forced himself to believe). According to Graham, they were random thoughts firing off as the brain shuts down, a scientific explanation to bury any intended significance. Graham ends that scene by boldly claiming that “we are all on our own.” Merrill comforts himself with his own belief system, maintaining that dodging vomit from a girl he was about to kiss was a “miracle,” and not just luck. This scene acts as a thesis for the film, a definition of both Graham and Merrill as characters, as well as a conflict of ideas that the movie wants to explore. It’s not Merrill’s movie, because he already accepts a higher power; instead, it’s Graham who can either choose to continue rejecting the idea of miracles, or accept it. Of course, no scene more clearly explains which notion he chooses better than the final action sequence — the inevitable confrontation between the aliens and humans. It’s funny that a scene with such a “take it or leave it” approach to its ideas can precede the climax of this film. Signs very much says that you can choose to believe something and that will bring you comfort, but if you choose not to, then you’re accepting that we are all on our own. It still allows for both points of view by the end, but it’s way less ambiguous towards the Hess family. 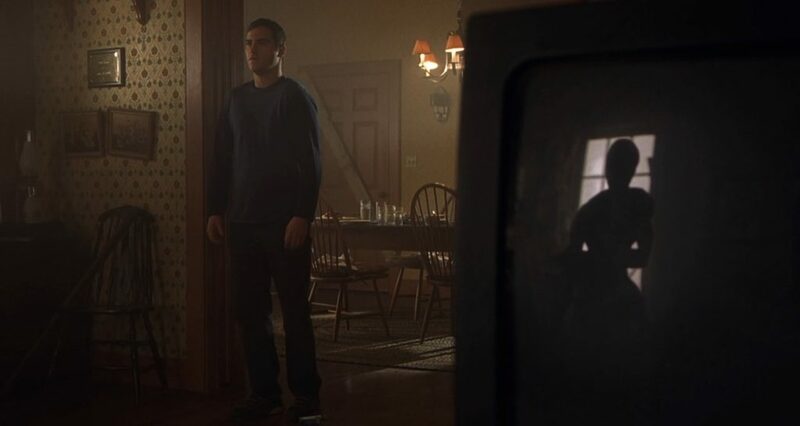 As Graham confronts the alien, he realizes that the water which his daughter Bo (Abigail Breslin) has been leaving in glasses all over the house is actually a weakness to the extraterrestrial. So yes, the twist to this movie is that the alien’s weakness is water — one could easily draw the line from an alien harvesting humans to it being weak to a substance often associated with life — but that water means so much more in the aftermath of the conversation between the Hess brothers. Graham realizes that his wife’s final words for Merrill — “Swing away” — apply perfectly to the situation he’s in. Merrill grabs the baseball bat and starts bashing the glasses of water in the direction of the alien. Meanwhile, Graham’s asthmatic son, Morgan (Rory Culkin), is the whole reason no one’s hiding in the basement anymore, as they ventured upstairs to grab his inhaler. In what can only be described as either pure dumb luck or an act of God, Morgan’s asthma attack has closed his lungs, preventing the alien from poisoning him. Between Bo’s refusal to finish her water, Merrill’s baseball bat being in the living room, and Morgan’s asthma, it is quite clear why someone might reflect on the culmination of all these things contrasted with their dismissal of the notion of fate. All of these “signs” amount to the inevitable conclusion that someone is looking out for Graham. Sure, he may have lost a wife, but in losing her he gained the necessary keys to helping the rest of his family survive the alien invasion. One of the things many people find preposterous when anyone talks about “acts of God” is that they can’t make the jump from a single moment (Graham’s wife’s last words) to meaning there is a God. It’s easy to simply balk at someone for believing in something because of a small instance that happened to someone else. What Shyamalan does in Signs is provide all of the small moments that culminate into an epiphany. He gives us the signs. It’s what shows like The Leftovers have conveyed even more effectively (though over more time). It’s not so much whether you believe that God exists or that there is a plan for everyone; it’s whether you understand how someone could believe that. This is what makes the entire journey for Graham into something profound. Maybe all of this seems like a series of coincidences, but if you’re looking for the world to make sense, coincidences start seeming more and more like signs.